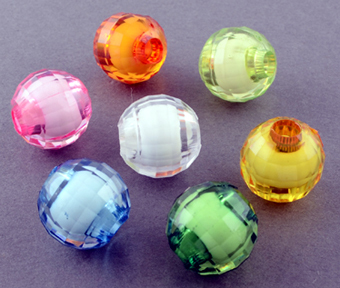 We use these beads in many toys ... they work well alone and fit particularly well within the "frames". Flower Caps, Blossom Frame, Daisy Frame, Bead Frame, Square Frame, Flower Frame and Petal Bead to name a few. A good size hole that works with shoe laces or curly laces, leather lacing or leather strips, paper rope and Paulie Rope! You need to experiment and see what your parrots enjoy ... these bigger beads are harder to pop open and offer a greater challenge for our Busy Beaks! Difficult to destroy, just pick them up and restring! If your bird loves these beads, try the Faceted Bead in Bead (similar bead with a slightly larger hole).